NewsRadio: "Big Day" and "Luncheon At The Waldorf"
"Big Day" / "Luncheon At The Waldorf"
It was May 2, 1995 when I first knew that I loved Newsradio. That was the night when I sat on my crummy couch in my two-bedroom furnished apartment and watched "Big Day." And although the pilot and "Smoking" had convinced me the show had great potential, it was "Big Day" that made me believe it could become one of my favorite shows of all time. All of us remember "Big Day" for its introduction of the big bonus and the shaft. The gimmick is a callback to the pilot, when Jimmy forced Dave to fire the news director he was replacing. As each character buttonholes Dave one by one to advocate for the big bonus (Bill) or beg to be spared the shaft (Matthew), Dave's exasperated martyr position becomes lonelier and lonelier. I remembered that Dave gave the big bonus to Catherine because she didn't lobby for it, but I had forgotten the even more telling moment that immediately follows — when Dave tells the staff that he'll be taking the shaft himself, just to make them feel guilty. Of course, nobody feels guilty; Matthew even says, "God bless you, Dave," for sparing him. We in the audience feel bad for Dave, who has spent the episode trying to find a way to be a good guy. Yet that pity is tempered with some disgust for his blatant, doomed appeal for sympathy, which he tosses out despite the fact that he knows even as he's saying it that it makes him look pathetic. That's a complex emotion. And what makes Newsradio great, at its best, is that it embraces complexity — of character, tone, blocking, pacing — in an extremely simplistic medium. Somehow this doesn't diminish the comedy. Somehow this enhances how funny the show is. And I don't think that effect marks it as a show that's too "smart" for the average viewer, a complaint that gets lodged against other great shows like Arrested Development and Sportsnight, for example. Newsradio doesn't wear its complexity on its sleeve; in fact, it rather revels in the lowest-common-denominator elements of its premise and execution, like physical comedy and highly stereotyped characters. Yet in the timing, in the little moments of interaction, and in the show's willingness to subvert itself at the drop of a hat, that complexity yields an excess of pleasures over and above what is needed to make basic comic ideas work. The B-story in "Big Day" is almost as sublime as the big bonus and the shaft: Bill's constant battle with the food that keeps appearing on his desk. The joke here is half in the camera blocking — as soon as the focus moves away from the desk surface, you can bet that the next time we see it there will be some ginormous pastry on a paper plate sitting there all deadpan and innocent. And it's the impetus for a piece of truly inspired ensemble work: Bill calling Matthew's desk from the booth and asking Dave to take care of the desk clutter. When Dave complies and the spaghetti-eating extra glops his load all over the desk, Matthew's phone immediately rings. Almost as good is Bill throwing pencils at the booth window-wall to get Dave's attention — and then continuing to throw them at a moving target as Dave ascends the stairs to the booth. Why? Because inside that booth, doing his job, Bill feels impotent at the task that's truly important: dominating the newsroom. That pencil throwing is pure acting out. Matthew's sad-sack qualities really hit their stride in "Big Day," too. After following Jimmy around talking about all the work he's doing and how he's probably going to stay late and arrive early yet again, he confesses to Dave: "He's probably noticed that I come in late and I'm always leaving early," with a defeatist shrug like it's a condition completely out of his control. His thrice-shafted history is the impetus for the "Theme From Shaft" dialogue between Bill and Joe, a bit that's elevated beautifully by Jimmy James crossing casually behind the pair and commenting "I can dig it." Any show would have a hard time following an all-time high like "Big Day," but "Luncheon At The Waldorf," while decidedly minor, isn't half bad. I can't help being creeped out by the sexual-harassment storyline, even though it's undercut in the third act when Beth reveals that she harassed Bill rather than the other way around. 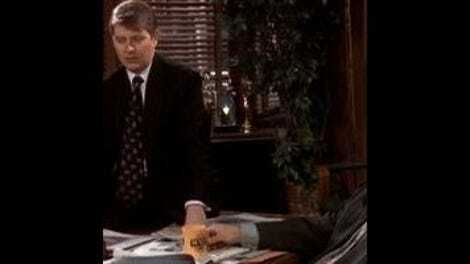 Although Newsradio puts its own spin on the theme, the premise is pretty much standard-issue workplace comedy. And as Noel pointed out midway through our viewing of "Big Day," the magnificent thing about that episode is that it's pure invention. The workplace setting provides the conflict, but the particulars of the dilemma (not to mention the magically-appearing food subplot) are entirely new. That's what separated Newsradio from the pack: they quickly became untethered to the ostensible tradition in which they were operating, and were freed to make comedy that drew from just about everywhere. "Luncheon At The Waldorf" has one classic bit, however: Dave confronting Matthew about his long-distance phone abuse while Matthew is enjoying a very long-distance conversation. "Je vous telephoné un autre temps," Matthew says in a drawl familiar to viewers of the Alexander Payne sequence in Paris, je t'aime. "Mon supervisór est ici." And the cold opens to both episodes have a lot of snap. In "Big Day," everyone in their turn leaves Dave in the dark about what is special about April 19 while Lisa watches smugly from the sidelines, and in "Luncheon," Dave crosses by Lisa, Beth, and Matthew standing around Lisa's desk, then comes back from out of frame to ask them for at least the pretense of work. From these lofty heights, I'm hoping that the shortened Season 1 will sail to a smooth landing in preparation for its gala relaunch in the full Season 2. But "Rat Funeral" approaches, my friends. Stay with me; I will need your comfort. - Lisa has a terrific time in "Big Day," from being caught in the compromising position of smelling Dave's jacket to her breezy certainty that she's getting the big bonus (in addition to the one Dave gives her on a semi-nightly basis). We find out about her math genius abilities, leading Bill to smile indulgently at "college girls." And that little flip where she pushes her hair behind her ear is just so adorable. I sure hope it's as cute when I do it (or does the exasperated expression I get from having hair in my face ruin the effect?). - Want to teach a directing-for-television class on how to use the space in a large primary set for maximum comic effect? Have the students watch "Big Day." - Although Bill's daddy/lust thing in "Luncheon" makes me squirm, he gets two good McNeal moments: His sycophant "I hear that!" response to Jimmy's announcement that he's going to feed the dogs (followed by a complete collapse of his convivial happy-talk face into fear and self-loathing), and the way he says to Beth, "You are a sassy one, aren't you?" — a pedestrian line rescued by great delivery. - That blue dress is really … really … short. Beth's despairing aside to Lisa, "You can't pull it down any farther," would be strangely hilarious if I weren't so worried about the situation Beth's getting herself into. Maybe it's just me, but the ick factor prevents me from being much amused by "Luncheon." - Jimmy's advice to live by: "Don't punch the clock with the time card in your pants." - I'm a sucker for in medias res storytelling, and I love the sense in "Big Day" that Dave has wandered into the middle of a longstanding tradition that everyone approaches with their own personal histories of anxiety or entitlement. Other sitcoms might tell us about the culture on display, but Newsradio shows us through the reactions of the characters. Bravo, I say. - "That idea is both fair and democratic, and I want no part of it."